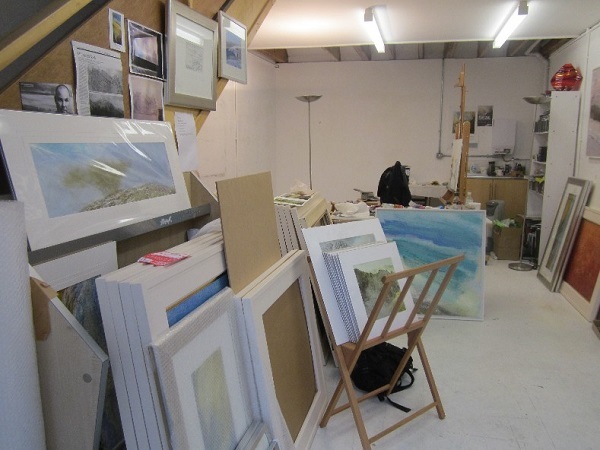 The annual Courtyard Studios Open Weekend isn’t just a great opportunity to promote and sell my work ….it is, by necessity, a great opportunity to clean, tidy and generally re-organise the studio. 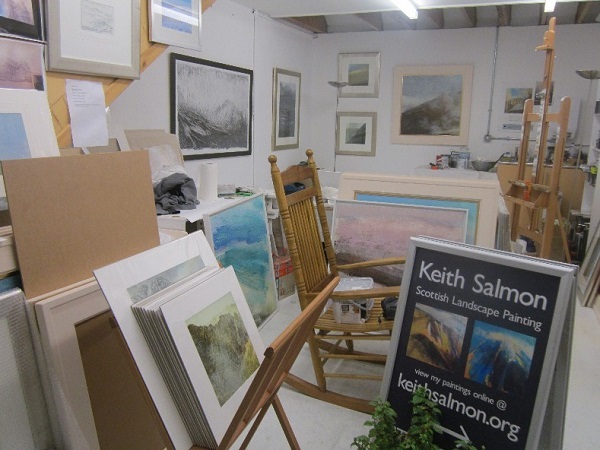 I’d like to think I’d do this periodically even without the excuse of getting the studio ready for the Open Weekend once a year ….but well……I guess in all honesty, I would always prefer to paint and the tidying would get put off ….and off and off! The thing is, when and how to do the ‘big tidy’. There seems to be two opposing lines of thought on this subject. There are those, (and I’ve been included in this camp before) that leave it to the last minute and have a mad ….and I mean MAD, long day on the Friday before the Open Weekend. Our studio rep, Brian, is going for this option this year apparently, but I doubt that he can really come close to matching a former tenant, Jamie. He really did leave it to the last minute and he, being a very prolific painter, really did have a lot of tidying to do each year. When all the rest of us plodded wearily home around eight or nine O’clock on the Friday evening, Jamie studio would be a hive of activity with much moving of paintings, climbing of step ladders and cursing! By all accounts this quite often went on into the early hours of the morning. All credit to him though, he was always there with his studio open on the dot of eleven the next morning waiting for the first visitors….and his studio would be looking great. The other option, and this is the one I’ve gone for this year, is to take several days getting the studio ready. It means of course, you don’t get any actual painting done, but it is a bit more relaxed and certainly less stressful. I started clearing the top of one of my tables on Monday afternoon, did a little bit more on Tuesday and then got into the swing of it properly, yesterday. I did say to Nita though, that doing it this way, the job does tend to expand to fit the time! Indeed, yesterday after repainting the end walls, I spent many hours just moving paintings around ….and around before finally selecting and hanging five pieces. Finally, yesterday evening, I repainted the floor at the far end of the studio. This is usually the area where I do all my work and so was in a bad state. Along with all the splashes of paint there was also a good covering of graphite after all the big drawings I’ve been doing. Needless to say, I painted myself away from the sink which I’d left full of soapy water to clean the brush in! Hopefully the floor will be dry when I get in later today and I can start moving all the stuff currently stacked everywhere in the front section of the studio, onto the clean floor at the back. Once this is done, I can start painting the main wall and hanging pictures on that. If I can get this done by this evening I’ll have all Friday to do the final tidying and then go around fixing labels, cleaning picture glass etc. It always seems a bit daunting when everything is in disarray, but once you get a few paintings up and a bit of the floor looking clean (ish), it all seems worth it. This year I do actually have a cut off point on Friday evening. A former college friend of mine is calling in at eight o’clock on Friday evening on his way up to see his mum who lives on the Isle of Bute. We’ve assured him we’ll both have our studios ready by eight so that we can all go off for a meal in our local Indian restaurant. It’ll be a nice way to finish off the week of tidying. Anyway, if you live in the area do come down to the Courtyard studios this weekend. There will be 12 of us taking part and it’s a great opportunity to see the very latest work by some of Ayrshire’s leading artists and makers…..including, painting, drawing, photography, ceramics, stained glass, hand book-binding and jewellery. Hope to see some of you there.